Is technology at work your friend or foe? Technology has replaced human labour as long as it has existed. As technology advances and the amount of data continues to grow, the age of artificial intelligence and automation in the workplace moves ever closer. Increased productivity via digital transformation should be an engine for economic growth. But anyone who’s ever seen Terminator can easily picture a time when machines forget who works for whom. In economies that have the most to gain, human beings in the workplace could have the most to lose. That’s why a thoughtful, compassionate vision is needed to make sure tomorrow’s workers have the skills to compete in the digital world. Being able to create a human-friendly innovation economy is today’s defining challenge and opportunity. Addressing this challenge means having to identify its various causes. Doing so is difficult, as any innovation economy will include many inputs that don’t even exist yet. But past and present analysis shows that technology has had two impacts on our work: to enhance and replace. A human-friendly innovation economy will need to address both dynamics. Starting with the latter, technology has replaced human labour as long as it has existed. Indeed, it can be traced back to our need to exceed our limits as humans. Just as the wheel allowed one person to push what had taken 10 people to lift, the engine allowed one person to move what it had taken hundreds of people to push. While early 20th Century advances seemed promising, the exponential digital progress of recent decades can be concerning. This stems partly from a lack of education, as we sometimes fear what we don’t understand. But it also stems from a very real and significant human labour cost. Manufacturing in the US, for example, declined from 16% of the American workforce in 1996 to 8% in 2016. This is a stark drop. Few are left unaffected by the worry, but it shouldn’t overwhelm us. There are benefits to progress – to realise them though, we need to prepare ourselves. These benefits are largely recognized by the second historical impact of technology: enhancing human labour. Though often overshadowed by the fear of mass unemployment, the benefits of technological progress are almost impossible to overstate. Digitalization allows companies to do more of what their customers want – better, faster and cheaper. Indeed, digital augmentation of employees can turn them into ‘superheroes’: a line worker with robotic support can produce more goods; a lawyer with real-time case analysis will produce a stronger argument; a biochemist with data-informed genomic models can cure more diseases. These employees flying through production barriers are products of our present and future digital reality. These digital benefits are being recognised in C-suites across industries. 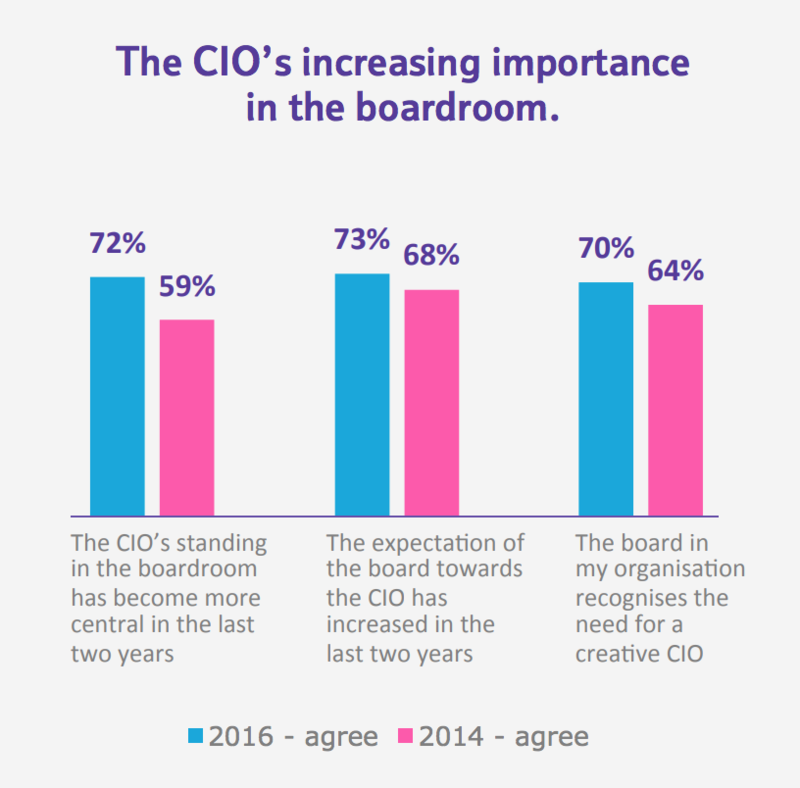 Three out of four chief executives describe digital transformation as a top priority, while 86% of large companies have appointed Chief Digital Officers, and 72% of organizations believe the Chief Information Officer role has become more central to the board room in the last two years. Image: BT CIO report, 2016. Yet, despite universal acknowledgement of digital benefits, we are seemingly unable or unwilling to fully embrace it, due to the skills gap being a key factor. Lack of IT skills already holds back digital transformation. With sustained technological advancement and inadequate training, this gap will only widen, prompting the question: what skills and attributes will people need to compete in this digital workplace, to create an innovation economy and drive economic inclusion? The answer lies in education. As technological progress becomes less and less tangible, we need to provide more and more relevant education. STEM curriculums, long the standard of advanced education, must become STREAMD – Science, Technology, Robotics, Engineering, Arts, Maths and Design. This breadth and depth of training reflects the development of an innovation economy beyond IT, with a growing emphasis on design and experience skills, systems and computational thinking, digital economics, sociology, behavioural economics and advanced mathematics. It won’t be enough to teach an expanded curriculum to a narrow population. We’ll need to fuel a more diverse pipeline of talent, inclusive of women and other underrepresented groups in technology, to better reflect the world we serve. Translating these admirable ideals into actionable progress is often difficult. Though scepticism of educational reform and employment training may be right, there’s too much at stake to let past failures define future preparedness. Progress shouldn’t suffer while company leaders point at legislative failures and legislators point at the evils of the private sector. Striking the balance between automated work activities and employee involvement needs a multi-stakeholder approach, in which both governments and companies have a vested interest. Companies, especially technology companies, have a responsibility to support STREAMD educational initiatives, bolstered partly by a shareholder responsibility to ensure a sustainable workforce. Digital transformation will create all sorts of opportunities to drive economic growth and there need to be educational initiatives put in place so that our future workforces have the right skills. Only then can we ensure more people are positioned to benefit from economic gains. Only then can we justifiably claim progress.